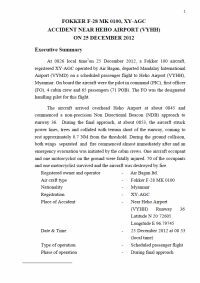 An Air Bagan Fokker 100 aircraft registered XY-AGC departed Yangon International Airport, Myanmar on a domestic scheduled passenger flight to Mandalay International Airport with the captain as pilot flying. The aircraft was refueled at Mandalay after 60 passengers disembarked and 46 passengers boarded. The captain made the briefing and completed the aircraft checks. At 08:26 local time, the flight departed Mandalay to Heho Airport. The first officer was designated as the Pilot Flying for the flight. The aircraft climbed to FL130 and the captain contacted Heho ATC at 50 NM from Heho. Heho ATC provided the present weather condition (wind calm, visibility 3000 m, distinct fog, temperature 17°C, QNH 1018 mb, runway 36 in use). At about 08:36 local time, the first officer started the crew briefing. The aircraft started descend to 9000 ft and continued to overhead the Heho NDB. At about 08:47 local time, while heading 220 degrees and descending to 6000 ft the flight commenced a non-precision Non Directional Beacon (NDB) approach to runway 36. During the final inbound track at about 2.5 NM to the runway at 08:52, the EGPWS aural warning called out "500". The captain initiated "Alt hold" at about 08:53, just before the EGPWS alert "100" "50" 40" "30" and the aircraft struck 66 KV power lines, trees, telephone cables, a fence and collided with terrain short of the runway, coming to rest approximately 0.7 NM from the threshold. During the ground collision, both wings separated and a fire commenced almost immediately. An emergency evacuation was initiated by the cabin crews. One aircraft occupant and one motorcyclist on the ground were fatally injured, 70 of the occupants and one motorcyclist survived and the aircraft was destroyed by fire. - During the final approach, the aircraft descended below the MDA and the crew did not follow the operator SOP's. - The pilots had no corrective action against to change VMC to IMC during bad weather condition and insufficient time for effective respond to last moment. - Captain of the aircraft had insufficient assessment on the risk that assigned the FO as PF. - There may be under pressure by the following aircrafts as the first plane on that day to Heho. Department of Civil Aviation ensure the Air Operator\'s implementation of FDR analyses Programmes. Air Bagan operation ensure the qualitative requirements of operational personal with non-precision NDB approach training with IMC, awareness of MDA, and EGPWS alert. Air Bagan operation ensure to access multi-crew operation of CRM training, supervision of captain and the risk FO to perform the PF. Distance from Mandalay-Annisaton Airport to Heho Airport as the crow flies is 135 km (84 miles).